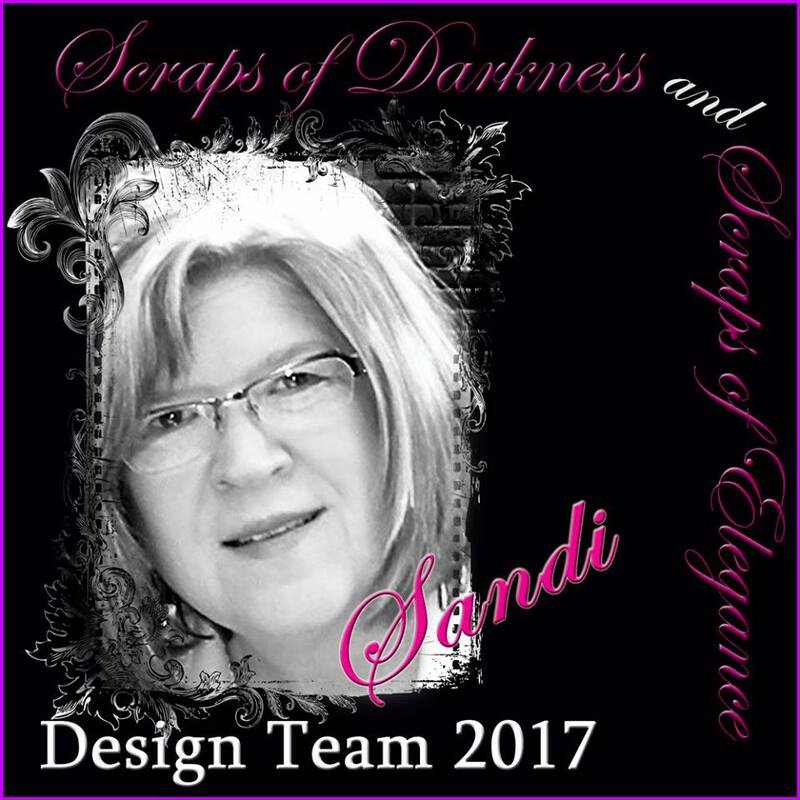 Scraps of Darkness and Scraps of Elegance: Two marvelous Mixed Media layouts from Sandi! Hello, Scraps of Darkness/Elegance fans! 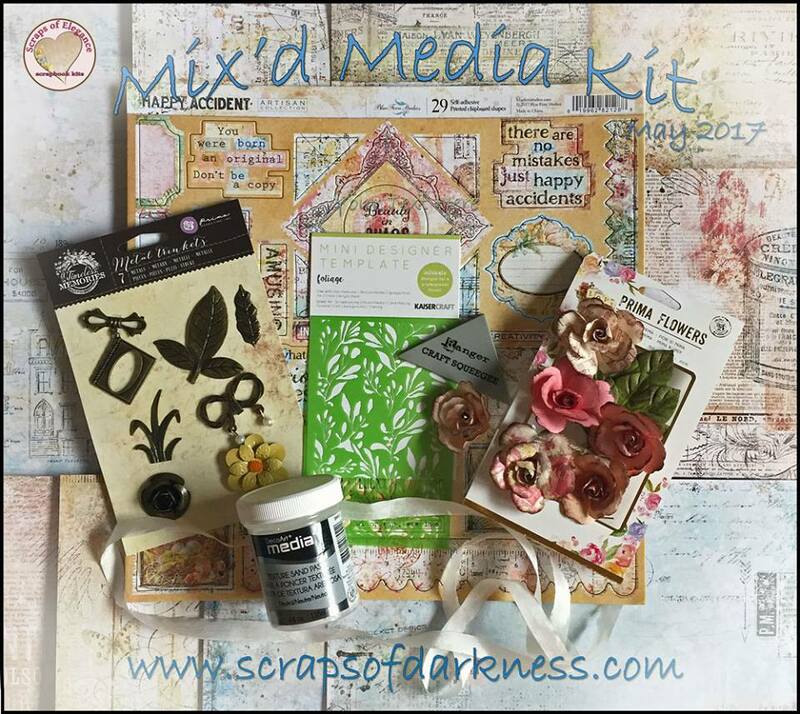 Sandi here with you today sharing my first project with the May 2017 Scraps of Elegance Kit "Mix'd Media Kit" as well as a few of the add-ons. I believe that this kit is already Sold Out, so if you've been wavering on joining the Kit Club, now is the time to get signed up and never miss another great Kit again! 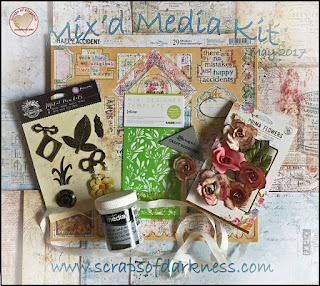 The Main Kit focuses around Blue Fern Studios Happy Accident paper collection with lots of wonderful embellishments included to round things out! I've also used the Tim Holtz ephemera from the Elements add-on as well as the Slue Fern Studios Halftone stamp and Arrow Words chipboard also included in that add-on. This layout began as what I call my obligatory "pink" layout for the month, wink, wink! With a multi-colored kit, I always try to highlight a variety of colors. As you can see, my pink layout got peach-y very quickly which is much what I prefer anyway ... but my intentions were good, lol. I've used the Happy Accident Fortuity as my base layer and used Layering cards for my vertical piece and photo mats. As is my normal practice, I began with gesso, stamping, stenciling and some random misting. The mist was painted on and spritzed with water to run. This being a Mix'd Media Kit, I felt the need to showcase that. The Happy Accident papers are also part of Blue Fern Studios Artisan Collection which has fewer distinct vintage images and more of a mixed media art feel to them. After adding a gessoed doily chipboard from my stash to anchor my photos, I began adding my florals which are a combination of the Prima Main Kit flowers as well as the Floral add-ons which are all also by Prima. There are a few random Blue Fern Studios Attic Charm flowers from the Scraps of Darkness online store that I've mixed in. You can find them Here and HERE. I consider them must-haves! In this close-up, you can see part of the Tim Holtz ephemera from the Elements add-on as well as some of the Happy Accident co-ordinating chipboard found in the Main Kit. Another floral cluster in this corner. You can see that I've used pink and peach together and they blend nicely with these papers. The Blue Fern Studios Halftone stamp is actually part of my stash but comes in the Elements add-on. I've used it all over the page to create depth and interest. Of course, I've added some of my usual cheesecloth and art stones. I love the butterfly ephemera from the Elements add-on. So perfect as a filler on most any project! Some splattered gesso everywhere to blend everything. Got to take those angle photos, you know! I love that I ended up with a rich array of color! I am also sharing another project featuring the April "A Song of Spring" Kit from Scraps of Elegance. This Kit is built around the gorgeous 49 and Market Scents of Nature paper as well as Blue Fern Studios Spring Parade. For my base layers I've used the Scents of Nature Fly Away paper as my foundation and layered it with Beauty Abound where I tore the corner to reveal that gorgeous dark purple from underneath. My mixed media work consisted mostly of stamping with a variety of 3 different stamps and misting. No texture paste on this one! Just some clear and white gesso here and there. Of course, I had fun altering the Memory Hardware Resin Frame by Frank Garcia (found in the Elements add-on) with the Art Alchemy. paint and Artisan Powder unclouded in the Color add-on. My photo layers (Lucille Ball) were ephemera from the Elements add-on. And of course, lots of florals from the Flower add-on. I've been in a bit of a monochromatic mood with my flowers lately, so on a couple of this month's projects you'll note less variety but deeper color intensity by staying with the same color familiar or neutrals. My frame is turned sideways and tucked under the photo and ephemera. I've been generous with flower laying and completed my composition with the addition of color using the Spectrum Noir pen in Fig from the Creativity Kit. A single gorgeous butterfly from the Wings and Things 3D pieces found in the Elements add-on kit. The watch piece is from my stash of goodies. For my title I snagged a die cut from my stash and colorized it with the Spectrum Noir pen. Here's a close-up of the lower right focal point created with ephemera, florals and a Flair from the Main Kit. I love creating dimension. This is really a gorgeous page but it was hard to capture that in my photos. One last dimensional shot showing how I added water to the color to create some flow. Coating your paper with clear gesso in the beginning helps the color to move with water application. Please visit the STORE to get your. shopping fix or to get more information on subscribing to the Kits!